This hike on the PCT was special for several reasons. It was our first backpacking trip of the year, after waiting through a long cold winter. We love the mountains but we don’t camp in the snow, and let’s face it: We don’t live in Southern California because we love Winter Sports. Not at all. It was also our first backpacking event after waiting for Vicki’s mysterious shinsplints to finally finish healing. In other words, we couldn’t even hike out in the desert the last few months, right when the weather was finally prime to do so. 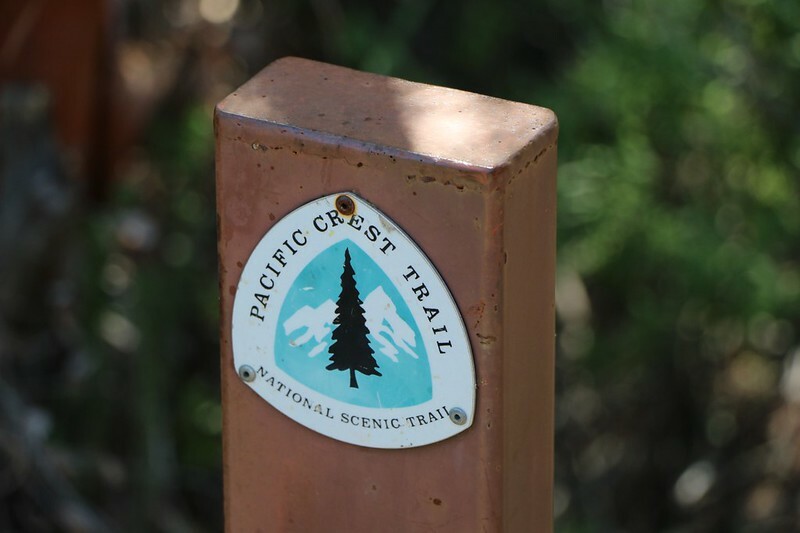 And, lastly and most importantly, this trip was intended to complete the final sub-section of California Section A on the Pacific Crest Trail that we had yet to hike. Hooray! 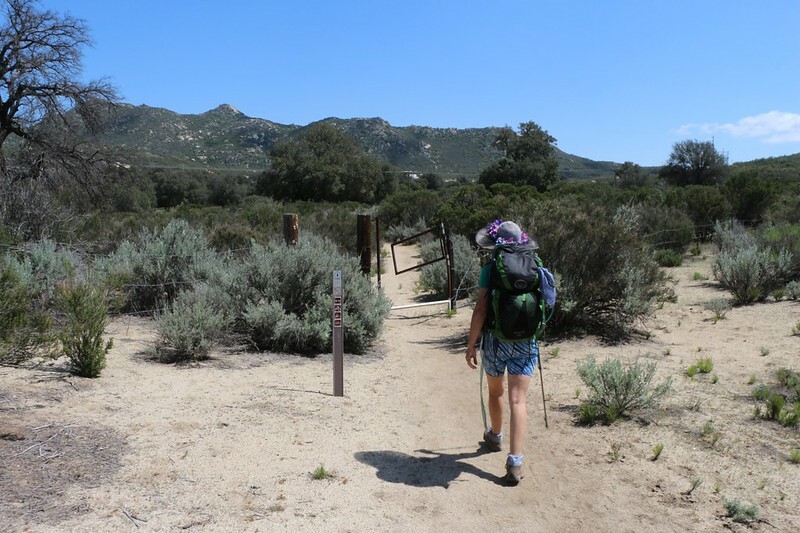 This final piece of trail was only about twelve miles long, so technically we could have hiked it in a day, but we decided that it would be more fun to make it into a backpacking trip, staying the night at the Lake Morena Campground. This campground had been for many years the site of the annual PCT Kick-Off, and we thought that it would be fitting for us to stay there, even though we are only section hikers. And then when I checked online for “Kick-Off” information, I discovered that it would no longer be held at all! We were a year too late. I guess the whole thing got out of hand and became mostly a party and not so much a place to share hiking information, since the info can be gotten on the internet so easily these days. So we got our reservations made for a campsite directly on the PCT, and called in our daughter to help us with some car-shuttling. The day arrived and soon enough we had left our car at the far northern end and were hefting our packs down south at the other end. 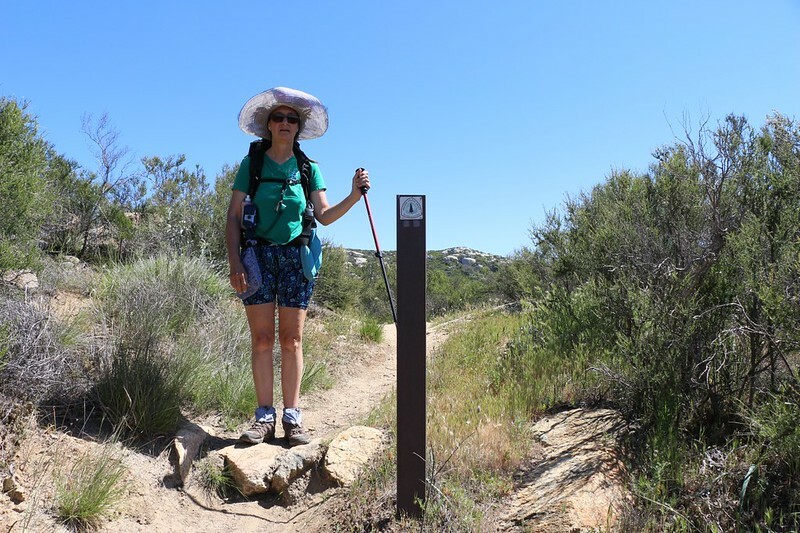 We thanked our daughter and headed off for the PCT. 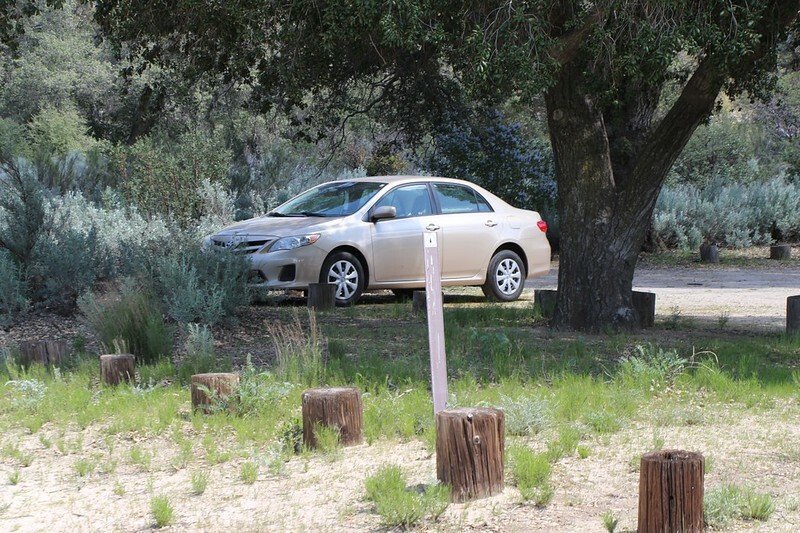 It crossed Hauser Canyon Road about a mile or so west of the locked gate. 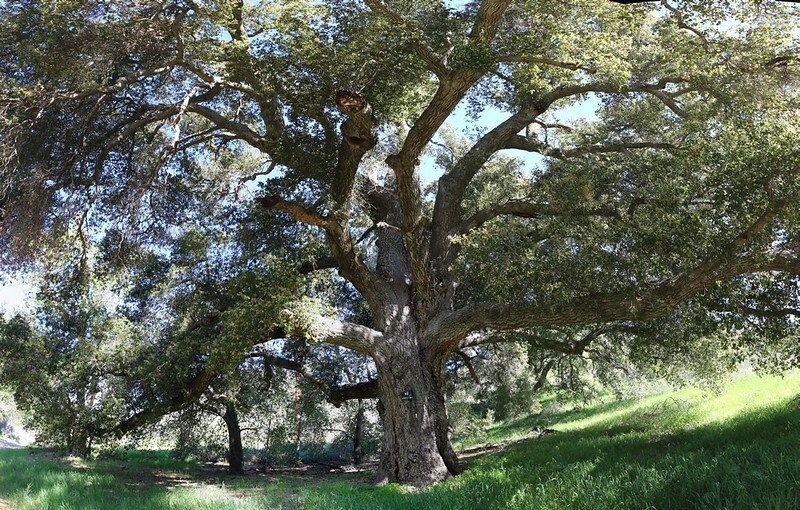 The canyon was full of huge old oaks and long green grass. Flowers were blooming everywhere. 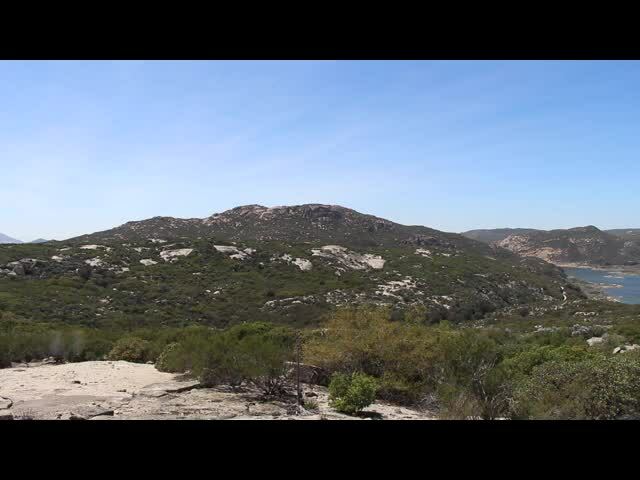 San Diego sure is beautiful in the Spring. The road headed gently downhill along the valley floor, and soon enough we even saw running water! It had been a very wet Winter and the land had yet to dry out. Soon enough we arrived at the PCT intersection. There were some folks camping just across the stream, still in their tents even this late in the morning, but we didn’t care. 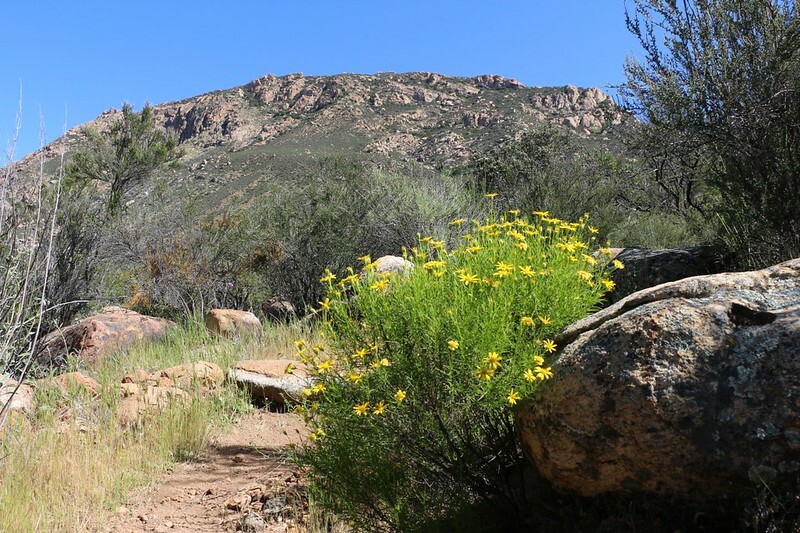 We knew that the tough part of the day’s hike was about to begin: We had to ascend about a thousand feet, up to a pass just east of a rather imposing rocky peak named Morena Butte. As we climbed, the peak dominated our view, but we also gained better views both up and down the canyon. It was hot in the sun, but the air was cool and there was a fine breeze, so we never felt overheated. Perfect hiking weather, in other words. It took us a bit more than an hour to climb to the first saddle, where we took a “boot off” break. We let our feet air out in the breeze and read our books. 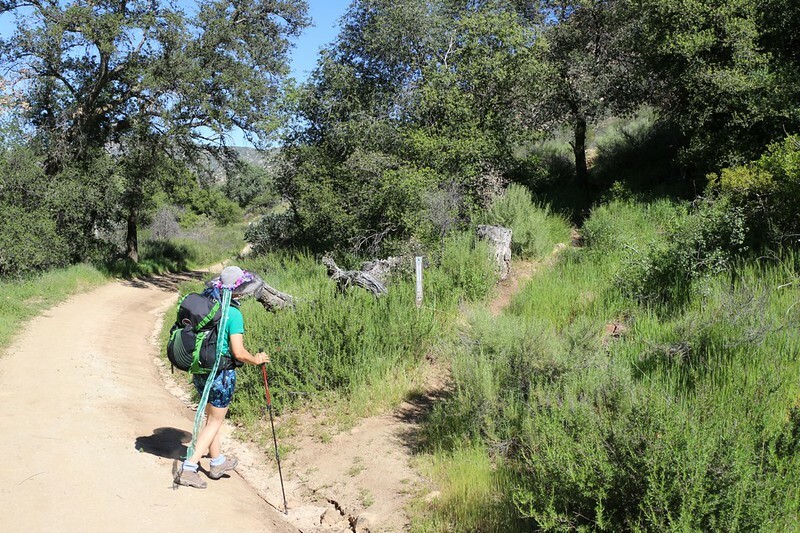 We spoke to other PCT Through-Hikers, who were excited to be starting their long journey north. Some were old, some were young, but they were all enthusiastic. We wished that we, too, could be starting a months-long journey like them. Mortgages and jobs and commitments are the bane of would-be adventurers, sadly. But maybe we’d go for it one of these days. At least that’s what we told ourselves. After that the trail did some easy ups and downs over the summit plateau. Typical PCT behavior. Easy hiking. 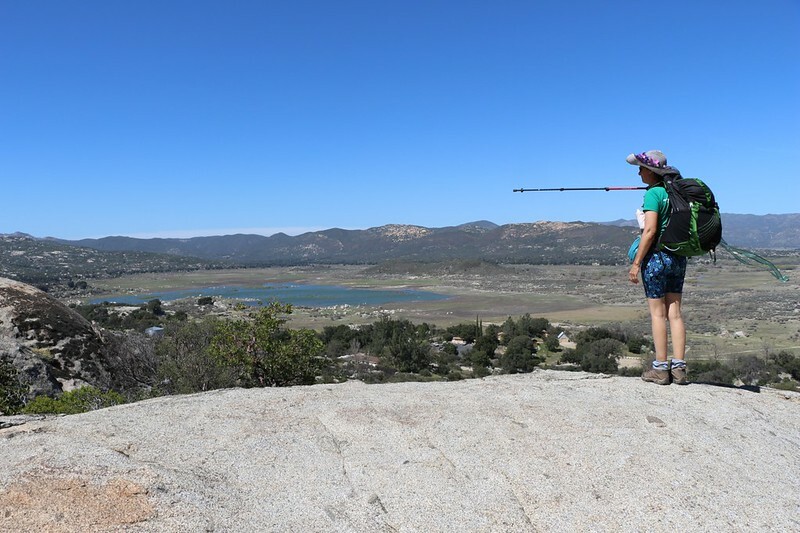 And then we topped the final ridge, the highest point of our hike, and Lake Morena came into view down below us. Even after all those Winter rains, the lake still wasn’t full, but it was much improved from it’s ultra-low drought state of 2016. 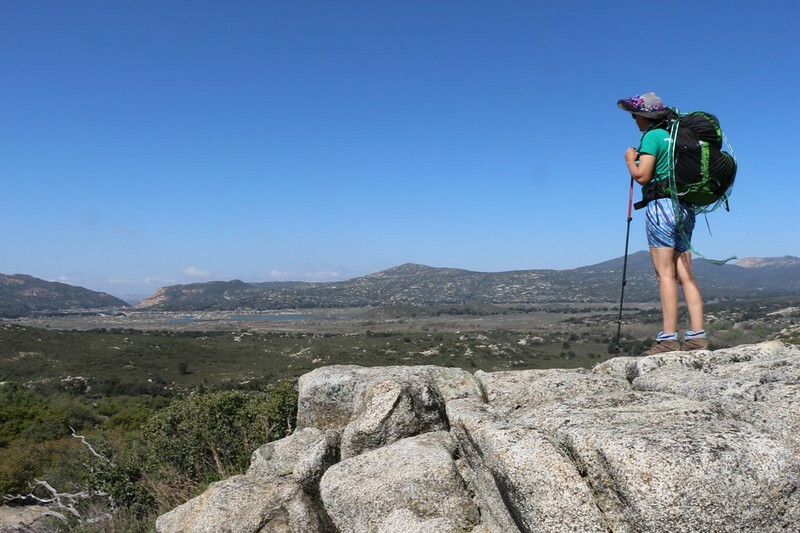 We stopped several times to take photos as we hiked along the ridge, plus once more for a “boot-off”, and by then the afternoon breeze was blowing strong. So much so that I had to place my hat’s adjustable string under my chin in order to keep it from blowing away. 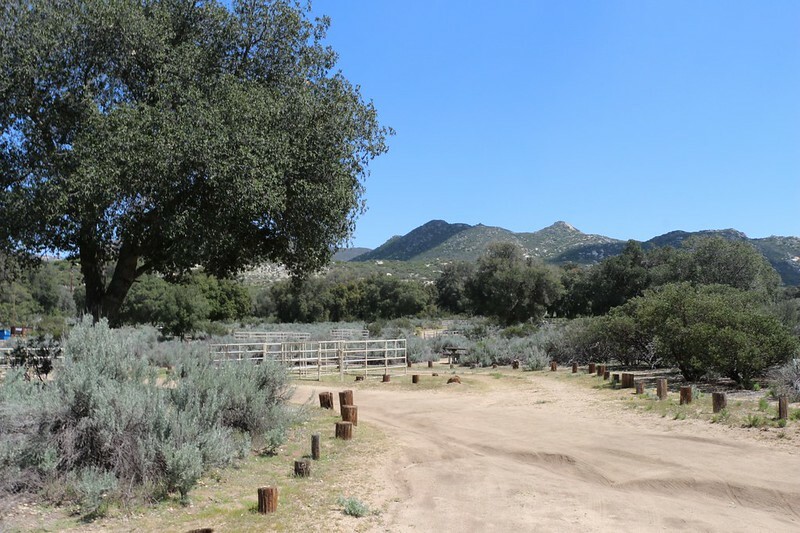 Eventually, the trail began descending in earnest, and we arrived at the end of our day’s hike: The Lake Morena Campground. We continued directly to our campsite. 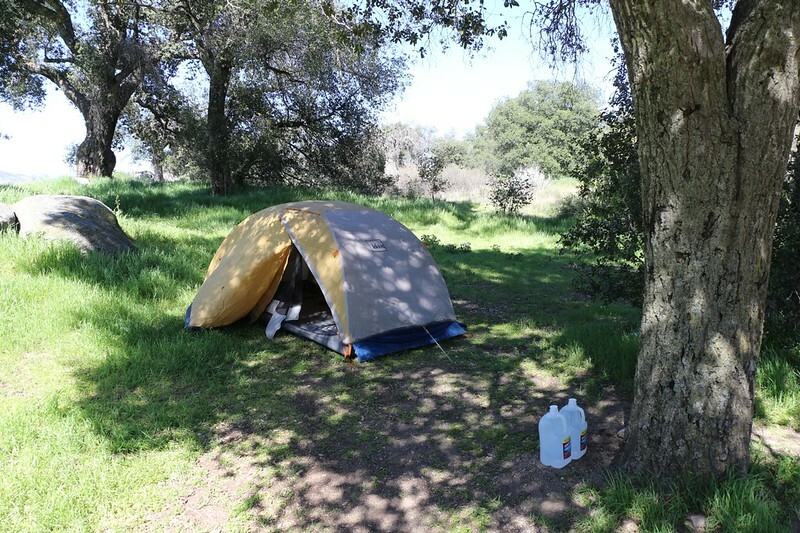 We had been there early this morning by car, and had dropped off two gallons of drinking water (at that time the campground was under a “boil water” alert for bad bacteria in their water system). We immediately set up the tent and got our gear in order. 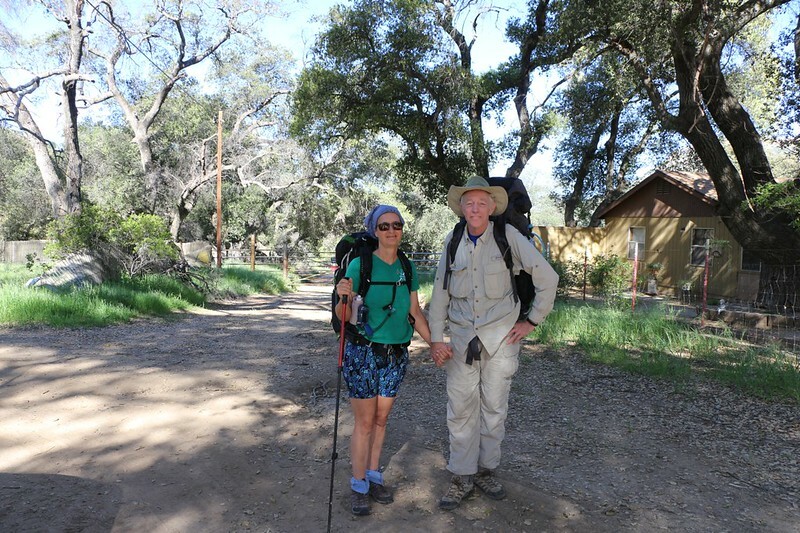 Then Vicki read her book while I walked to the Ranger Station and checked in. When it came time to cook dinner, however, we decided to be lazy. Well, maybe lazy isn’t the best word. “Actively lazy” might be a better description. We were lazy about actually cooking dinner, but we decided to get some exercise in order to find it. 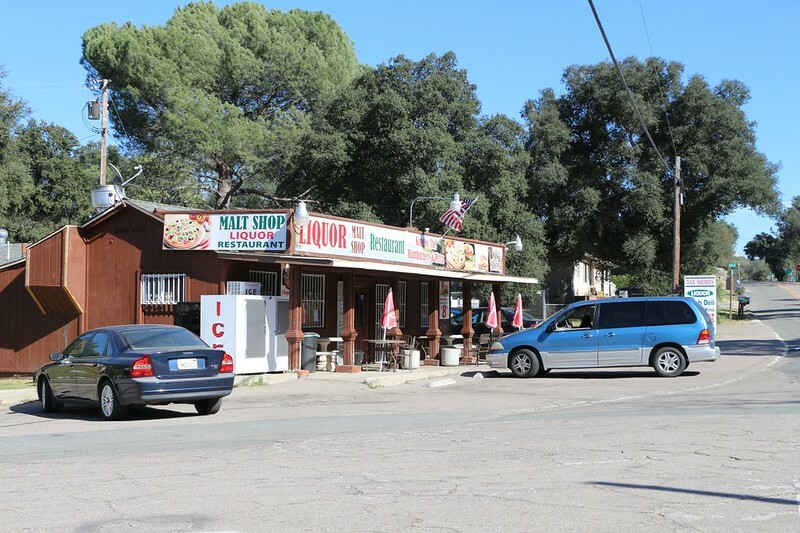 We took a walk into the town of Morena Village and headed straight for the Malt Shop. Vicki had a malt and some salad, whereas I had a burger and fries. Ahhh! Much better than that freeze-dried food we’d carried. After that, we went to bed before dark, and had to suffer through some noise before falling asleep. Our neighbors were all enjoying an evening campfire, and although they weren’t particularly loud, they were loud enough to keep me reading for an hour or so after dark. But it’s all good. I got some reading done and plenty of sleep, as well. We woke at dawn and it was still quite cool, so we stayed in our night clothes for a while. 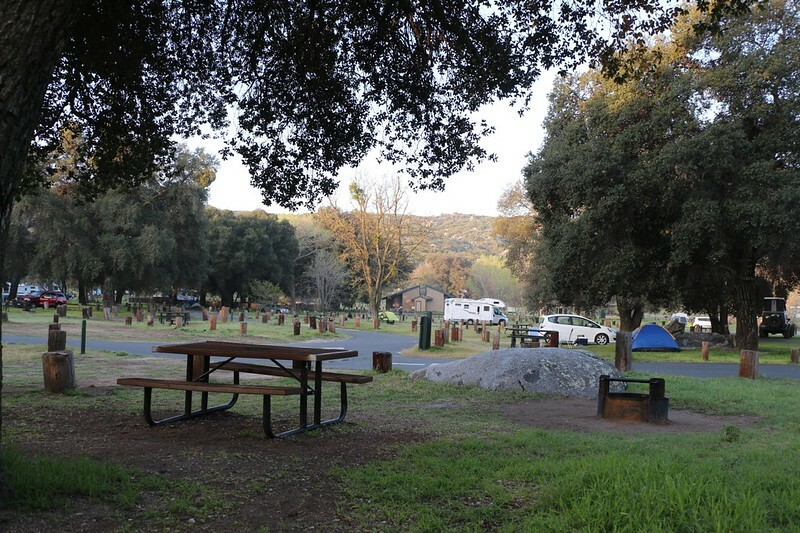 We went out and took a walk around the sleepy camp, which wasn’t very full as this was a weekday. 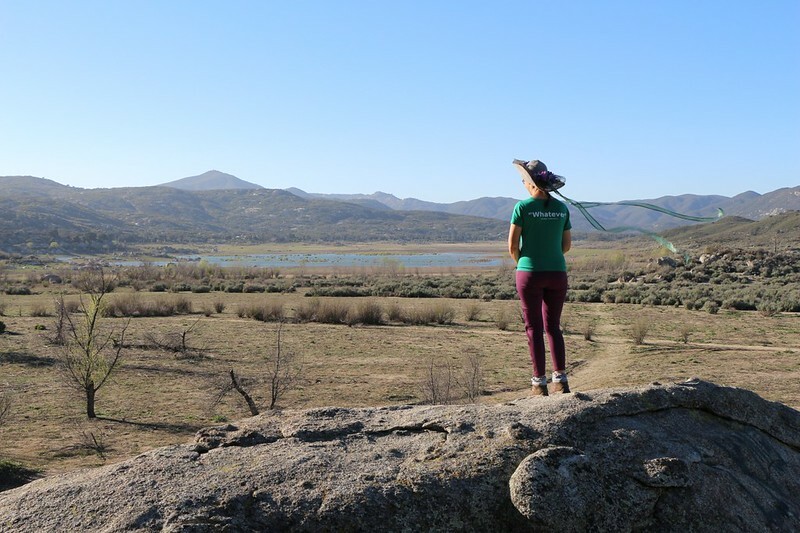 Then we came back and had some breakfast, sitting on granite boulders, sipping coffee in the morning sunlight. Very peaceful. Once the sun hit the tent we stayed inside enjoying the warmth for a short while. We were in no rush, after all, and only had six miles of easy hiking ahead of us. 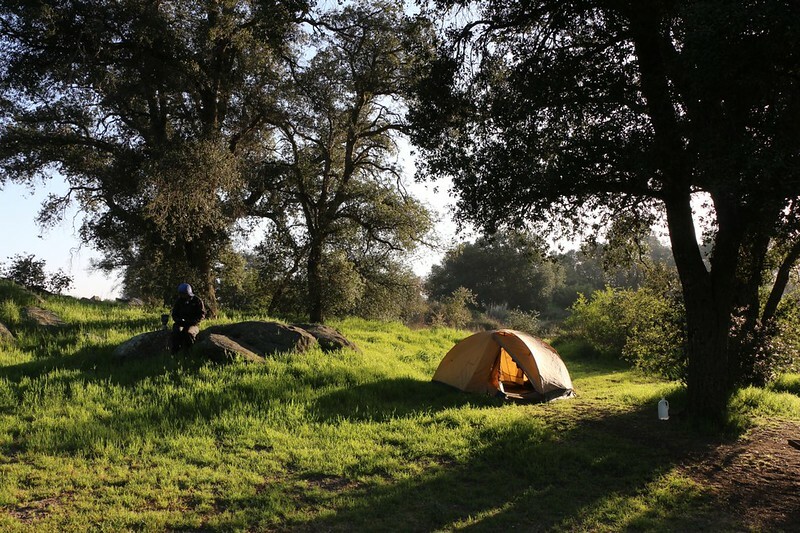 Eventually, we realized that we’d never get anywhere if we didn’t pack up our gear, so we got dressed and put everything away where it belonged. Thanks to the Malt Shop, we still had an unopened gallon of drinking water, so we labelled it and left it for the next folks to use. Then we said goodbye to our campsite and hiked onward. 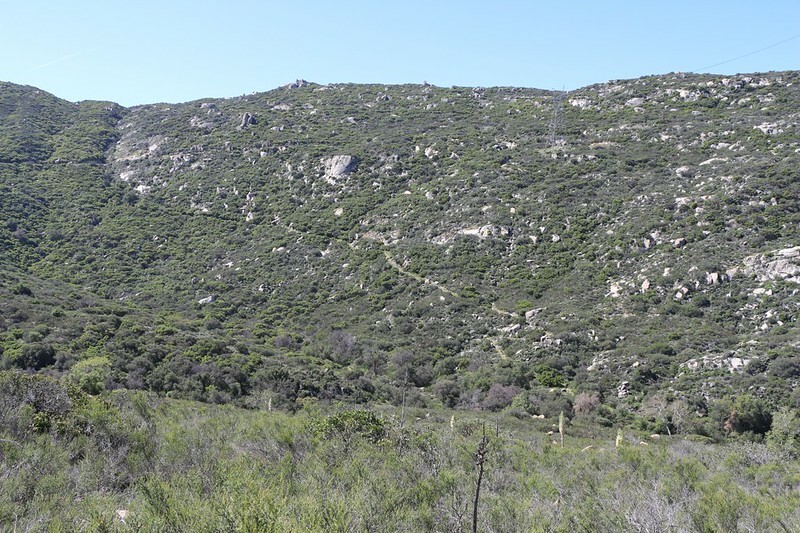 The trail continued through the chaparral and slowly climbed up on a ridge that overlooked the Morena Valley. 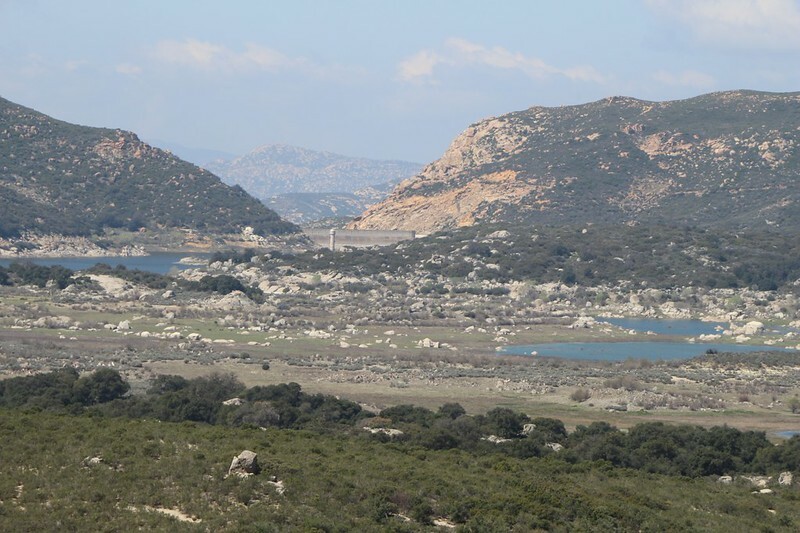 We saw the dam far to the west, and it was obvious that the lake could easily hold much more water. Maybe another year, as it looked like there wouldn’t be much more rain down here in Southern California this season. April showers are rare down here. Along the ridge, the trail was quite fun to hike, with plenty of views in all directions, and flowers blooming everywhere. The ridge ended as it neared the valley entrance where Cottonwood Creek was flowing. The trail descended toward the old cement bridge on Buckman Springs Road where it crosses the creek. On the way down we were treated to views north toward the Laguna Mountains, where the PCT began to climb in earnest, and where the Through-Hikers would truly learn the meaning of “uphill” hiking. This was when people began to realize that they’d packed too much gear, and that the gear they had was far too heavy. This is what drives the cottage industry which creates ultra-light (and ultra-expensive) tents, backpacks, sleeping bags, stoves, etc. 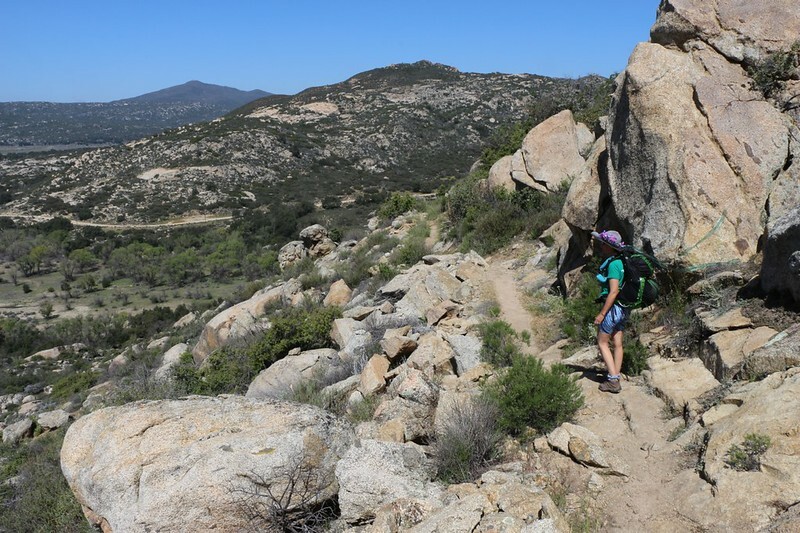 In fact, there’s a convenient backpacking store up at the top of the long grade in Mount Laguna which is more than happy to sell better equipment to unprepared hikers. Location, location, location! We went under the bridge, hoping to cross the creek, and there were no convenient logs or bridges or stepping-stones. This meant taking off our shoes and wading across the shallow creek. But not Vicki. 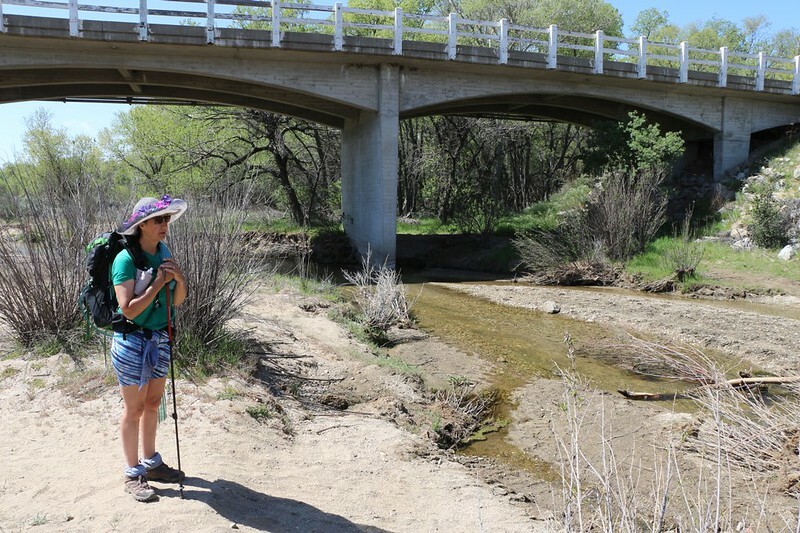 She decided that her feet were happy the way they were, and that hiking over the creek via the bridge was a better plan. So back we hiked, and discovered that the bridge was very old, very narrow, and had no sidewalk whatsoever. Luckily, traffic was very light, and so we crossed the bridge while standing on the narrow curb that supported the old wooden guardrail. When cars went by (at high speed) we would stop and turn sideways, providing a narrow profile. Of course, the cars didn’t like seeing us either, and they tended to move way over into the other lane when they could. All in all, it was pretty fun, and no harm done. 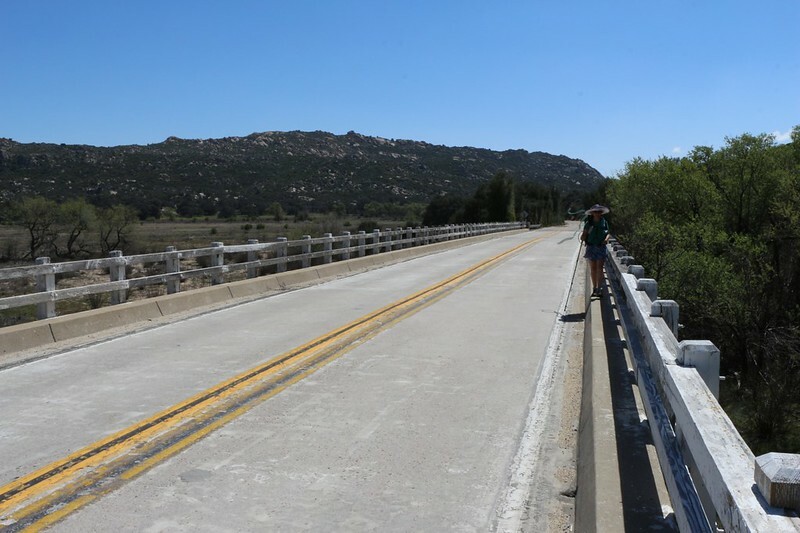 Crossing the bridge over Cottonwood Creek on Buckman Springs Road – Scary with no sidewalks! 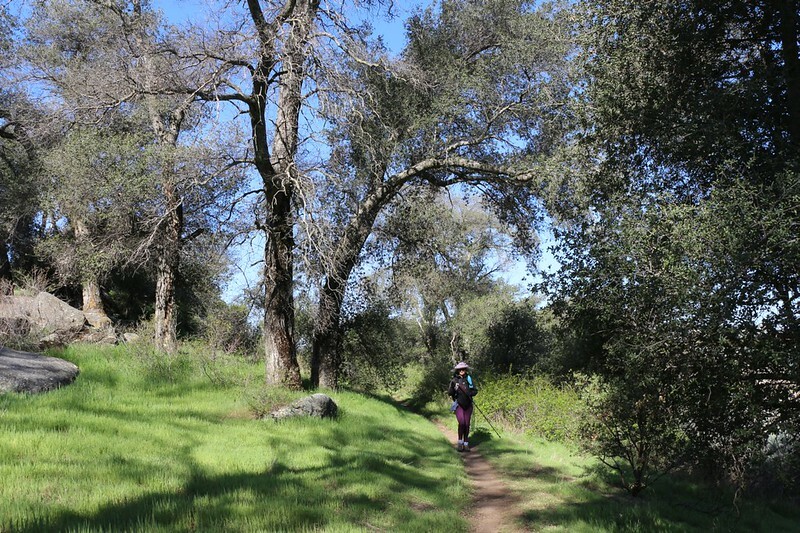 After that, the trail paralleled Buckman Springs Road as it made its way along the Cottonwood Valley. The valley was in actuality a huge meadow, and the grass was very green. Flowers were blooming in groups and patches all over the place. Very easy hiking, indeed. Eventually, the trail made a sharp right turn, heading east. This was the final stretch of trail on the way to the Boulder Oaks Campground where we’d left our car. We’d be heading home all too soon. We hiked along, obliviously happy about our little hiking weekend, and then it happened: The trail crossed Cottonwood Creek once more! And there were no bridges to save us this time. And no logs or rocks, either. It was all sand in this flat-bottomed valley. So we did what we had to do. 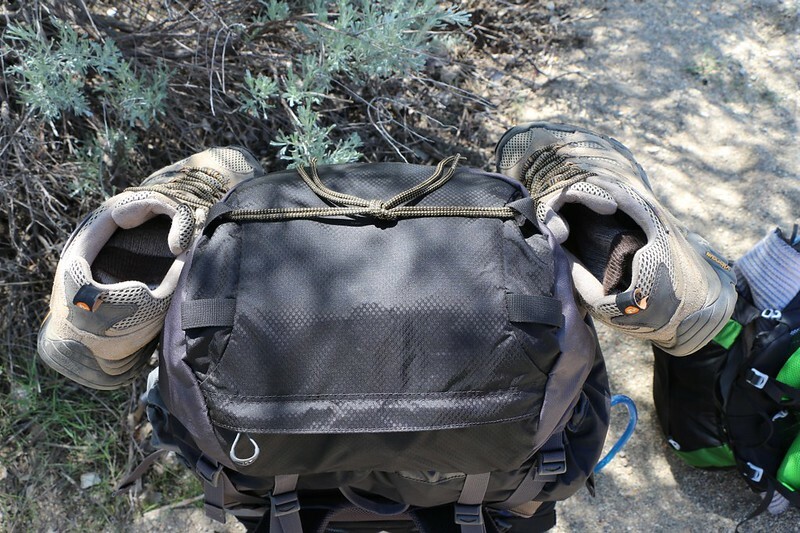 We took off our shoes and tied them to our packs. I rolled up my pants to my knees. Then we donned our packs and crossed the creek. And it was icy cold! Vicki stopped as soon as her feet began to get wet, but I continued on through. It was cold, oh yes, but not all that bad. It came up to about mid-calf, and before I knew it I was on the other side. Vicki followed, not liking it but what can you do? And then we took a rest in the sun while our feet dried. So that was the big excitement on our second and final day of hiking. Crossing a stream ten feet across and one foot deep. I admit that I may have blown it out of proportion with my writing style, but that’s what you get for reading a web page that says “mostly true tales” right at the very top. You were warned! After that, it was less than a half mile to the car. It was still early, barely noon, so we decided to stop at the eastern end of the campground and have our lunch. We’d carried it the whole way and we were not going to eat it in the car. So we sat down at a convenient picnic table and got out our books. We ate lunch and read our books, just the same as we would have had we been out in the middle of nowhere. Soon enough, we were back at the car, ready for a mere hour’s ride home. The two of us were both quite happy. We’d had a really fun time this trip, with only minimal miles to hike and no pressure to do much of anything. The had been plenty of flowers and good views along the way. 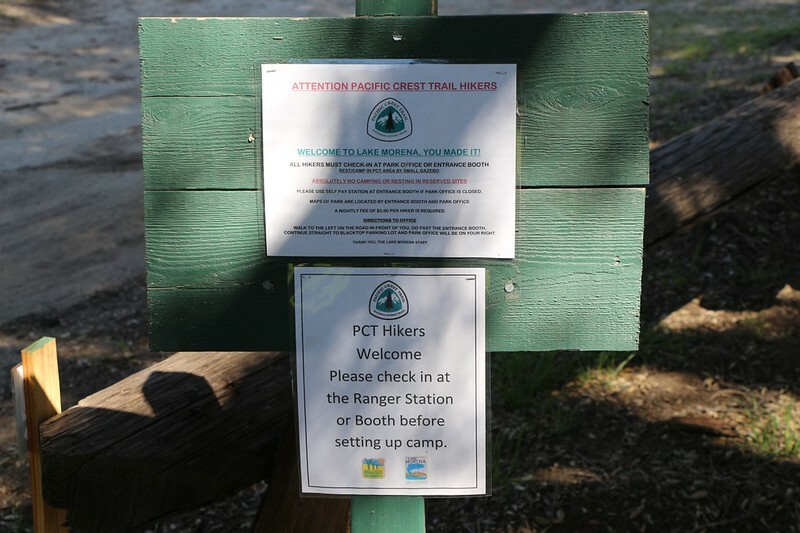 And even though they were hosting the PCT Kick-Off any more, we decided that this trip had been our own kick-off, and a great start to what we hoped would be a great hiking year. For even more photos and videos see my Flickr Page. 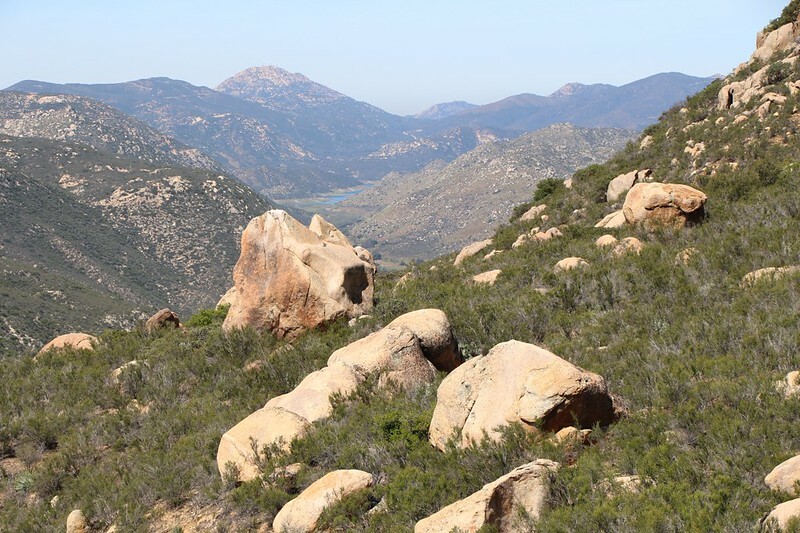 For a topographic map showing our hike and GPS track see my CalTopo Page.